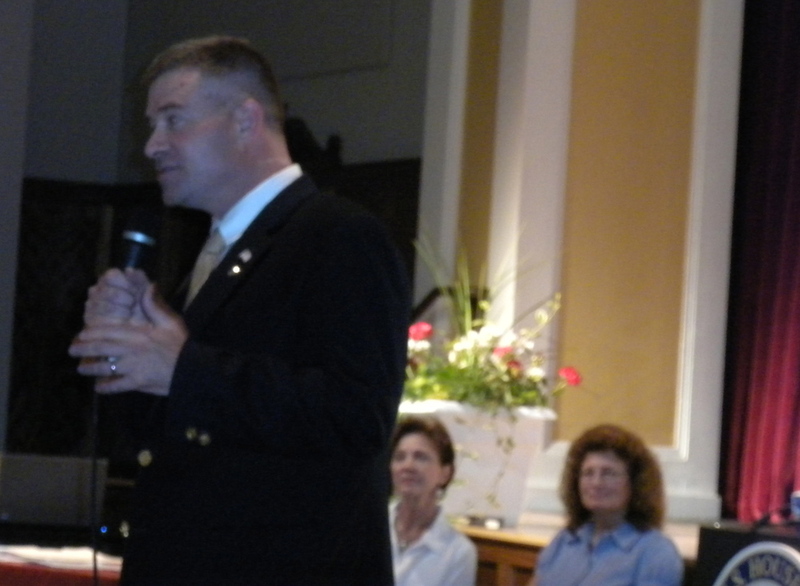 On Wednesday, before a crowd of almost two dozen residents, freshman Congressman Chris Gibson out linned his top priorites: creating jobs, the deficit and small business growth. Town Supervisor Cathy Moses and Assemblywoman Teresa Sayward introduced the Congressman at the Schroon Lake Central School Auditorium as residents listened to the Congressman speak about the federal budget and hear their concerns. He discussed the need to remove barriers that people face in starting a business and the barriers they face in accessing capital to do so. He felt more needed to be done to match potential small business owners with available funds. Regarding the deficit, Gibson called for more fiscal responsibility and less partisanship. He supports rolling back spending levels to what they were in 2008 and capping spending until the federal budget comes back into line. *Reform military spending and end wars that do not protect our national interest.Reduce executive branch power. *Preserve Medicare for seniors but expand the use of Health Savings Accounts and private insurance companies for others. *Reform Medicaid by providing states with block grants to administer. A question and answer period followed. One of the main concerns residents expressed was about the economy and lack of jobs. Gibson understood their concerns and reemphasized the need to enhance opportunities for small business. Some attendees expressed that they did not like changes to Medicare that would involve privatization of services as they already feel like they get too many solicitations from private insurance companies. Gibson pointed to Dr. Rugge’s Hudson Headwaters Medical Home project as an example of controlling health costs and said that more money was now being provided for rural health needs. Gibson agreed with residents that protecting the environment was a shared priority and stressed that Social Security and Medicare need to be preserved. He also emphasized that the budget he supports is a good place for a conversation to start on these issues. Were you there? Tel us about it in comments.